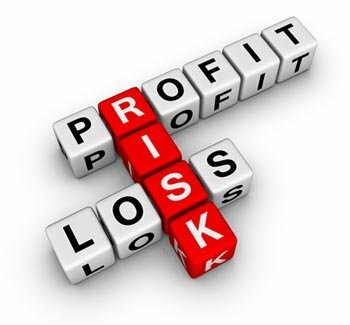 HBCU Money™ B-School: What Is Risk? With a stock, you are purchasing a piece of ownership in a company. With a bond, you are loaning money to a company. Returns from both of these investments require that that the company stays in business. If a company goes bankrupt and its assets are liquidated, common stockholders are the last in line to share in the proceeds. If there are assets, the company’s bondholders will be paid first, then holders of preferred stock. If you are a common stockholder, you get whatever is left, which may be nothing. If you are purchasing an annuity make sure you consider the financial strength of the insurance company issuing the annuity. You want to be sure that the company will still be around, and financially sound, during your payout phase. Even when companies aren’t in danger of failing, their stock price may fluctuate up or down. Large company stocks as a group, for example, have lost money on average about one out of every three years. Market fluctuations can be unnerving to some investors. A stock’s price can be affected by factors inside the company, such as a faulty product, or by events the company has no control over, such as political or market events. Inflation is a general upward movement of prices. Inflation reduces purchasing power, which is a risk for investors receiving a fixed rate of interest. The principal concern for individuals investing in cash equivalents is that inflation will erode returns. Interest rate changes can affect a bond’s value. If bonds are held to maturity the investor will receive the face value, plus interest. If sold before maturity, the bond may be worth more or less than the face value. Rising interest rates will make newly issued bonds more appealing to investors because the newer bonds will have a higher rate of interest than older ones. To sell an older bond with a lower interest rate, you might have to sell it at a discount. This refers to the risk that investors won’t find a market for their securities, potentially preventing them from buying or selling when they want. This can be the case with the more complicated investment products. It may also be the case with products that charge a penalty for early withdrawal or liquidation such as a certificate of deposit (CD). Not investing may result in insufficient funds to accomplish life’s goals. For most people, the only way to attain financial security is to save and invest over a long period of time. You need to have your money work for you. The Federal Deposit Insurance Corporation (FDIC) – Savings accounts, insured money market accounts, and certificates of deposit (CDs) are generally viewed as safe because they are federally insured by FDIC. This independent agency of the federal government insures your money up to $250,000 per insured bank. It is important to note that the total is per depositor not per account. But there’s a tradeoff between security and availability; your money earns a low interest rate. The FDIC insures deposits only. It does not insure securities, mutual funds, or similar types of investments that banks and thrift institutions may offer. The National Credit Union Administration (NCUA) –The National Credit Union Share Insurance Fund (NCUSIF) is the federal fund created by Congress in 1970 to insure credit union member’s deposits in federally insured credit unions. The Dodd -Frank Act permanently established NCUA’s standard maximum share insurance amount at $250,000. NCUSIF is backed by the full faith and credit of the U.S. Government. Securities Investors Protection Corporation (SIPC) – Securities you own, including mutual funds that are held for your account by a broker, or a bank’s brokerage subsidiary, are not insured against loss in value. The value of your investments can go up or down depending on the demand for them in the market. The Securities Investors Protection Corporation (SIPC), a non government entity, replaces missing stocks and other securities in customer accounts held by SIPC member firm up to $500,000, including up to $250,000 in cash, if the firm fails. For more information see www.sipc.org. This entry was posted in B-School and tagged investments, risk, sec. Bookmark the permalink.